I. Molecular Biology of Band 3 1. Molecular and cell biological aspects of the AE anion exchanger gene family (S.L. Alper). 2. Structure, molecular genetics and topology of the human red cell anion transporter (AE1) (M.J.A. Tanner, et al.). II. Kinetics 3. Kinetics of anion transport across the red cell membrane (J. Brahm, et al.). 4. 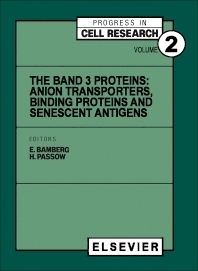 Mechanisms of substrate binding, inhibitor binding and ion translocation in band 3 and band 3 related proteins (P.A. Knauf, et al.). 5. Pressure dependence of anion transport in erythrocytes (V.A. Canfield, R.I. Macey). 6. Molecular probing of a hydrophilic/hydophobic interface in the transport domain of the anion exchange protein (AEP) (Z.I. Cabantchik, et al.). 7. Anion binding site in band 3 protein (L. Zaki). 8. Protein chemistry of the anion transport center of erythrocyte band 3. (N. Hamasaki, et al.). 9. Chemical labeling of a glutamate residue involved in proton-sulfate cotransport catalyzed by band 3 (M.L. Jennings). 10. Exploration of the mechanism of mouse erythroid band 3-mediated anion exchange by site-directed mutagenesis (H. Passow, et al.). 11. Evidence for a high and a low affinity C1-/HCO3- exchange system in human red cells (G.F. Fuhrmann, et al.). III. NMR and Spin Label Studies 12. Rates of anion transfer across erythrocyte membranes measured with NMR spectroscopy (P.W. Kuchel, et al.). 13. Spin labeling of band 3, the anion transport protein of the erythrocyte membrane (K.F. Schnell, et al.).14. Studies of band 3 function using substrate analogs: substrate specificity, thermodynamics, and anion binding (R. Labotka, et al.). IV. Electical Properties of Band 3 and the Red Cell Membrane 15. Potential dependence of mouse band 3-mediated anion exchange in Xenopus oocytes. (W. Schwarz, et al.). 16. Oscillating electric fields as possible probes for studying fast ion exchange (E. Donath, M. Egger). 17. Estimates of the Electrical Conductance of the Read Cell Membrane (J.F. Hoffman). V. Oligomer Formation, Folding and Conformational States 18. Oligomeric structure of the human erythrocyte band 3 anion transport protein (R.A.F. Reithmeier, J.R. Casey). 19. Band 3 quaternary states and allosteric control of function (J.M. Salhany). VI. Band 3 as a Binding Protein 20. The relationships between the oligomeric structure and the functions of human erythrocyte band 3 protein: The functional unit for the binding of ankyrin, hemoglobin and aldolase and for anion transport (D. Schubert). 21. Band 3: Calorimetry, cytoskeletal associations, role in metabolic regulation, and role in aging (P.S. Low). VII. Band 3 as a Senescent Antigen 22. Band 3 and erythrocyte removal (P. Arese, et al.). 23. Naturally occuring anti-band 3 antibodies: their dual specificity in providing potency (H.U. Lutz). Senescent cell antigen and band 3 in aging and disease (M.M.B. Kay). VIII. Relationship between band 3 and other Membrane Proteins 25. Some functional properties of band 3 protein in nucleated red cells (R. Motais, et al.). 26. Role of Na+, K+-ATPase and anion exchanger in 1 (band 3) as binding sites for the cytoskeleton (D. Drenckhahn, et al.). 27. Interactions between band 3 and other transport related proteins (A.K. Solomon). 28. Zero-length crosslinking of band 3 and glycophorin A in intact human erythrocytes (B. Deuticke et al.). X. Anion Transport in Other Cells and Tissues 29. Anion transport in the red blood cell of the mouse and in erythroleukemic K562 cells (H. Passow et al.). 30. Volume-activated chloride transport (A. Rothstein, E. Mack). 31. Substrate specificity of the organic anion and organic cation transport systems in the proximal renal tubule (K.J. Ullrich, et al.). XI. Appendix The anion exchange proteins: homology and secondary structure. (P. Wood). Index.